A house here, beside the road leading to Spoleto, belonged to a certain Diotallevio d' Antonio in the 15th century. He commissioned a fresco on the outside wall from a local painter, which depicted the Madonna and Child with St Francis and was dated by inscription to 3rd October, 1483. This image became an object of particular veneration in 1485, when the Madonna was seen to weep tears of blood. Miracles were soon attributed to the image, which attracted pious gift. The Commune appointed twelve of the leading men of Trevi as the Societas Sanctae Mariae Lacrimarum, charged with the administration of these funds and the construction of a new church to house the miraculous image. 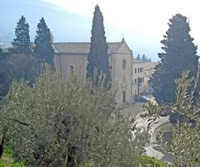 The site was given to the Olivetans who had recently acquired the Abbazia di San Pietro in Bovara. The transfer was initially contested, but Pope Innocent VIII approved it in 1489. Plans by the architect Francesco di Bartolomeo da Pietrasanta were approved in November, 1485. The Commune appointed him to oversee construction in 1488, and confirmed his appointment in 1490. Construction was still incomplete in 1500, when the Commune united it with its other church, San Giovanni Decollato, and transferred both to a community of Lateran Canons. They built the adjacent convent. The church was badly damaged by earthquakes in 1592, 1703 and1752. An inscription on the counter-facade records that Pope Clement XII commissioned its restoration in 1733, at the behest of his chaplain, Ludovico Valenti. In 1856, the church passed to the Congregation of the Most Holy Redeemer, which had been founded in 1732 by St Alphonsus Liguori. However, they were expelled in 1860, when the church passed back to the Commune. In 1935, the year of the death of the Blessed Peter Bonilli, the convent passed to his Suore della Sacra Famiglia. They still administer here the Istituto Medico Pedagogico, which cares for handicapped children. The fine portal (1495) is by Giovanni di Giampietro da Venezia. The Renaissance interior is in the form of a Latin cross. The side chapels belong to the original design. A number of monuments (16th and 17th centuries) of members of the Valenti family were subsequently erected between them (see below). This chapel (the 1st on the right), which must have been dedicated after 1500 (since St Ubaldus was claimed by the Lateran Canons who acquired the church at that date), was conceded to Pier Costanzo Ricci 1566. ✴four scenes from the life of the Virgin (the Nativity, the marriage of the Virgin, the flight into Egypt and the Visitation). This chapel (the 2nd on the right) was conceded to the people of Bovara in 1488, while the church was in construction, in return for their financial contribution. The chapel was conceded to Giacomo Valenti in 1679 and confirmed as a possession of his heirs in 1729. When Cardinal Erminio Valenti died in 1621, his heirs, Pompeo and Francesco Benatti-Piccolomini, erected this Baroque altar in the right transept to house the venerated fresco of the Madonna delle Lacrime (see below). The monument to Cardinal Valenti is on the left wall (see below). The miraculous image for which the church was built now forms the altarpiece of this altar. The high altar was conceded to Giacomo Valenti in 1683 and rebuilt using fragments of an ancient ciborium in the form of a temple between adoring angels. This is now on the altar of the Cappella di San Carlo Borromeo(see below). The present high altar dates to 1984. This chapel (on the right of the left transept), which was originally dedicated to SS Roch, Antony [of Padua?] and Sebastian, was re-dedicated soon after the canonisation of St Charles Borromeo. This chapel is on the left wall of the left transept. ✴The main panel of the Deposition is based on Raphael’s Pala Oddi (ca. 1503), which was originally in San Francesco al Prato, Perugia. ✴Figures of SS Ubaldus and Joseph (with his flowering staff) are on the side walls. ✴The lunette contains a figure of St Augustine with kneeling figures in white habits, presumably those of the Lateran Canons. This chapel (the 2nd on the left), which was originally dedicated to St Catherine of Alexandria, belonged to Tiberio Valenti (died 1566). Two panels (ca. 1520) from the chapel, which depict SS Catherine and Cecilia, are now in the Pinacoteca (see below). The Fathers of the Congregation of the Most Holy Redeemer re-dedicated the chapel to their founder, St Alphonsus Liguori, when they acquired the church in 1856. Its altarpiece (ca. 1856) depicts St Alphonsus adoring the Host. This chapel (the 1st on the left) was conceded to Benedetto Valenti (died 1541) in ca. 1530. Its original altarpiece (early 16th century) of the Pietà is now in the Pinacoteca (see below). The frescoes (ca. 1530) of the chapel were commissioned from Orazio Alfani. ✴Benedetto Valenti (1541) and his wife, Felicita Petrelli (died 1550). The painted decoration of the last three is by the Angelucci da Mevale workshop. These panels, which are attributed to Giovanni di Pietro, lo Spagna, came from the Cappella di Santa Caterina. They were removed in 1741, when the chapel was rededicated to St Alfonso. They are now in the Pinacoteca. Pope Clement VII gave this panel to Benedetto Valenti, his procurator fiscal, in Rome. It had apparently been confiscated from a man who had been executed for murder. Valenti installed it on the altar of his family chapel, the Cappella della Resurrezione, in 1531. The panel, which in the past has been attributed to Sebastiano del Piombo, has recently been attributed to Benedetto Coda. It was first transferred to the Pinacoteca in 1869 but subsequently returned to its original location at the request of the Valenti family. It was returned to the Pinacoteca after an attempted theft in 1923. This altarpiece, which is signed by Bernardino Gagliardi, is now in the Museo Diocesano, Spoleto. Return to Monuments of Trevi. Return to the Walk around Trevi.